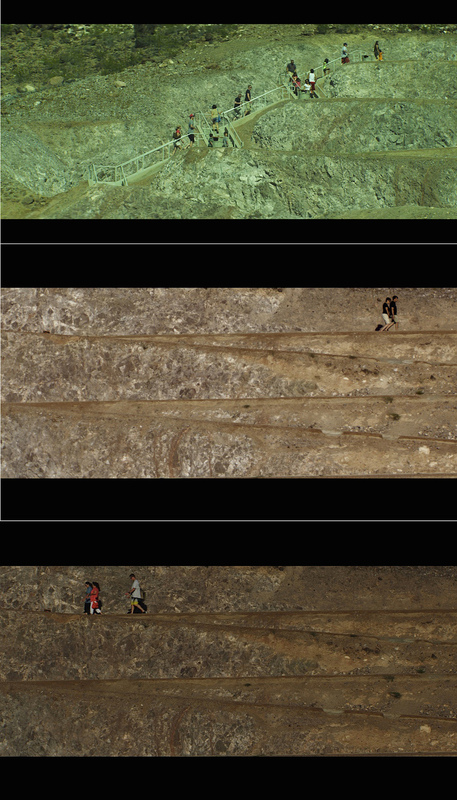 In NV Regional (2013), a video by filmmaker Colin Snapp, a seemingly endless procession of people plod up and down a steep, switchback trail in what appears to be an otherwise desolate location. As we watch, an incessant hum in the background becomes evermore distinct; it is the score to this journey. In reality, the film documents tourists at the Hoover Dam ascending and descending a well-trodden path that leads them to a lookout point. The sound is recorded noise emitted from power lines located at the parking lot of the site. Snapp has slowed down the recording to enhance the inherent droning nature of his video. Colin Snapp, “NV Regional,” 2012. Single channel digital video, TRT 90 minites. Courtesy of the artist. Absent this information however, the travelers and their surroundings appear otherworldly, like religious disciples on a desert pilgrimage. When the truth is revealed, we realize that a potentially hackneyed occurrence—that is, a dutiful tromp up a big hill to (inevitably) take photographs at a predetermined spot—can actually be infused with the divine. That NV Regional was filmed at the Hoover Dam, one of the grandest accomplishments of infrastructure in American history, adds another layer of meaning. A conscientious ticking off of the “To-Do List” of sites to see when on holiday seems a peculiarly American characteristic. That it is such a widely shared experience suffuses it with its pious quality. In NV Regional, the mundane is transformed into the monastic.